KIA Canada has some new ads out that double as helpful Public Service Announcements about how if you get in their cars to drive and you decide to use that time to multitask and put on makeup, the car will kill you. Death sells! 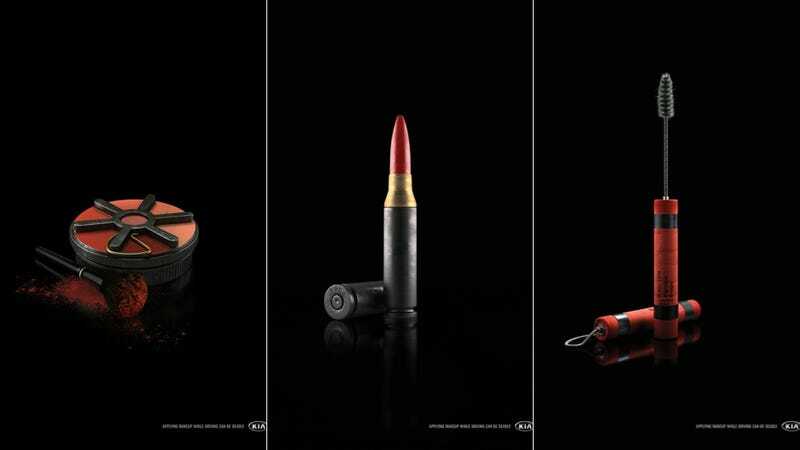 Each ad depicts a makeup tool as if it does double-duty as some sort of James Bond-esque killing object: the lipstick becomes a bullet, the mascara an explosive device. The tagline reads: “Applying Makeup While Driving Can Be Deadly”. What happened here, it appears, is that KIA Canada’s ad agency, Innocean Worldwide, saw the press success of the the Mini and VW PSAs and whipped up a generic campaign of their own for Kia. It's so cool when someone has a great idea and then other people decide to jump on board and proliferate those creative, brilliant ideas throughout the world.